If you’re not reading this the week it’s written, the windchill is -6 degrees Fahrenheit, and it’s 2 p.m. You can imagine how cold it was last night, and how cold it’s going to get tonight! However, we like to embrace the seasons around here, so we thought it would be fun to include some chill in our craft today. We’re painting with ice! 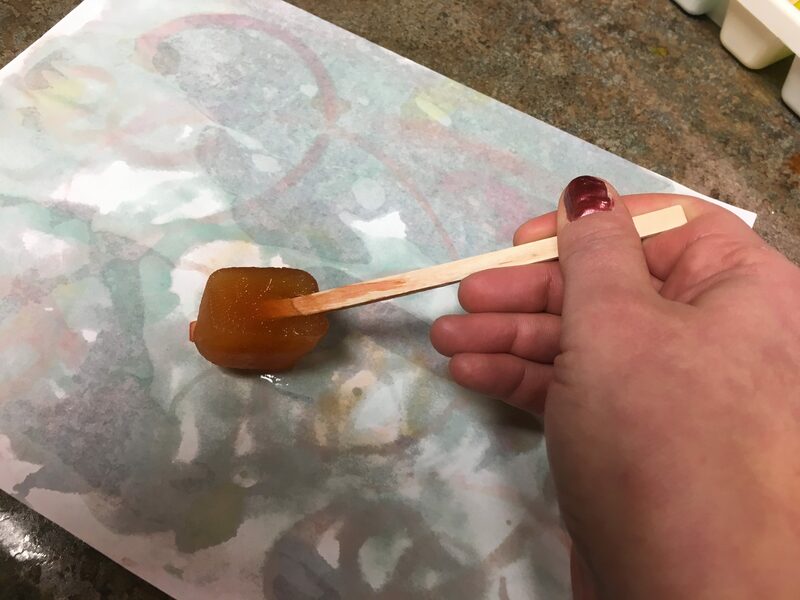 This is a super simple craft, and it’s one that you won’t have to worry about if kids take a lick. Fill your ice cube tray or small cups with water and add food coloring. 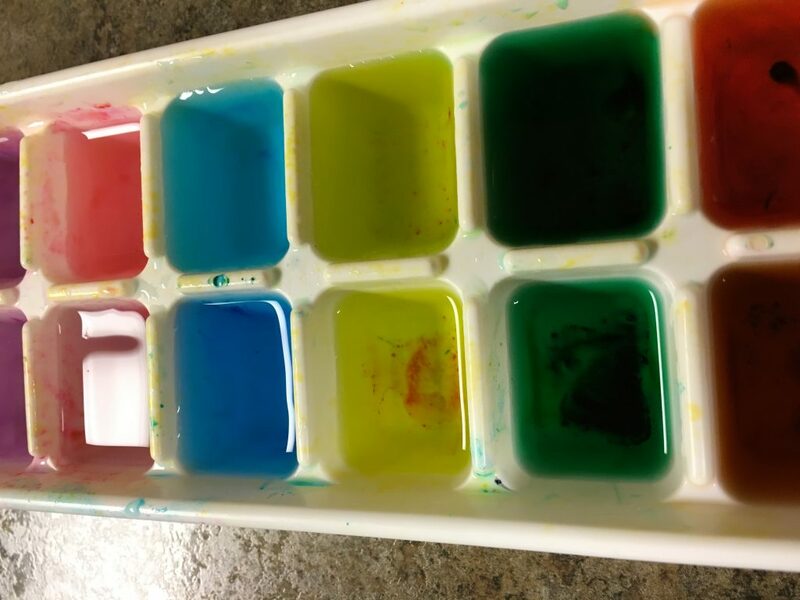 I thought my ice cubes were pretty colorful, but they didn’t turn out quite as colorful on paper as I would have liked, so I would err on the edge of too much food coloring. With kids helping, I’m sure that won’t be hard to do. I would recommend making your colors a little darker than mine. 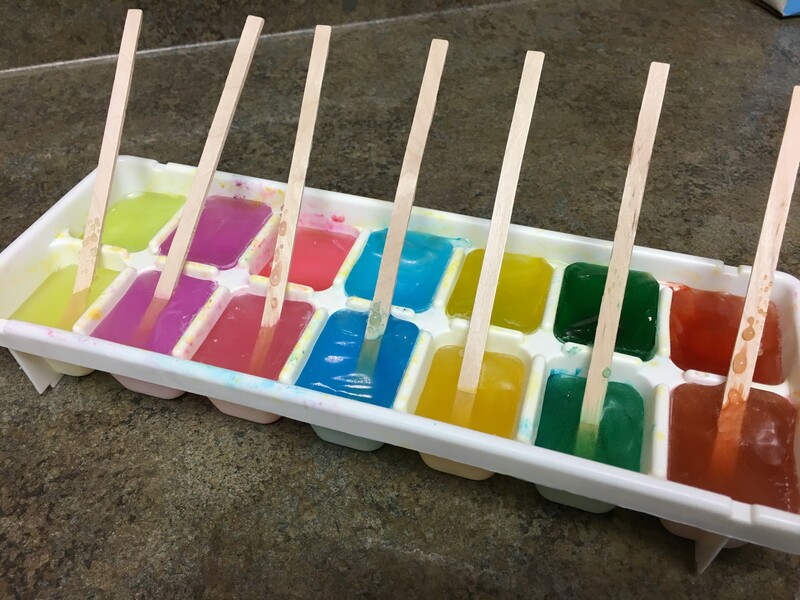 Put popsicle sticks, skewers or whatever you want to use as a handle into each ice cube opening. Either catch them before they are completely frozen or take them out of the freezer and let them sit for about 45 minutes so there is a little liquid to work with. Holding onto the wooden handle you created, rub the ice around on your sheet of paper. If it dries, dip it back in its liquid to get it wet and start again. Mix your colors. Create layers. It’s basically tie-die for paper! When you’re done, there’s hardly any clean-up. Wipe the area. Let the ice melt, and wash up your ice cube trays. It’s a simple, fun and pretty cheap craft that will help you appreciate the cold. Find another fun colored ice craft here!